This equipment is able to bond in three different modes (wedge, ball and bump bonding) for small scale production lines. A DSC measures the amount of energy released or absorbed by a sample which is heated, cooled and kept at constant temperature. 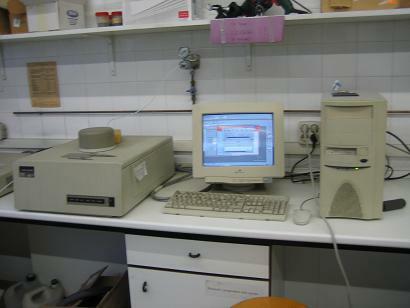 Combined with a measurement of the sample's temperature, DSC provides a reliable measurement of phase transformations. The DSC7 of Perkin Elmer is a power compensation system, which measures directly the energy of the reaction and provides closer peaks and high sensitivity. The use of platinum resistance thermometers allows measuring with precision and repeatability. One of our DSC can work as a modulated DSC which allows greater resolution in the small thermal events, such as glass transitions. Calorimetric accuracy of less than 1% with less than 1 μW of sensitivity and precision of 0.1%. Temperature Range: -170°C to 723°C with 0.1°C accuracy and precision. Heating rates up to 300°C / min. It can be used in static or dynamic atmosphere of nitrogen, argon, helium, carbon dioxide, air, oxygen and other gases. 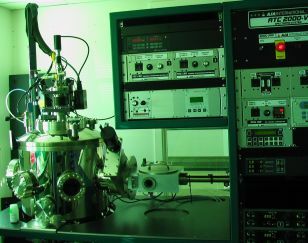 3ω system for measuring the thermal conductivity in thin films. 3ω technique uses an alternating current for heating and a lock-in amplifier that directly measures the thermal conductivity of a conductor or dielectric, either bulk or thin layer. 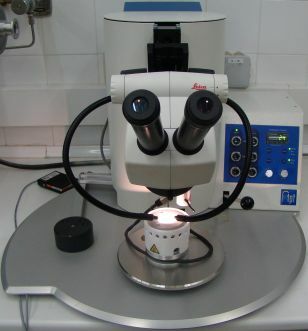 A small heating line set on the surface of the sample by photolithography works as both, heater and thermometer. The equipment of thin film preparation uses the techniques of preparing DC sputtering and thermal evaporation. The equipment has 4 DC sputtering guns and two sources for thermal evaporation. Four different gas inputs make evaporations at reactive atmospheres possible and allows to obtain different compounds. It permits evaporation of metallic materials due to its 4 DC sources that work independently. With a pulsed source (pulsed DC) semiconductor materials as Si or Ge can be evaporated. The equipment is prepared to reach vacuum levels up to 3x10-8mbar.